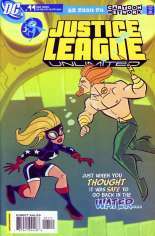 Published August, 2005 (Modern Age) by DC Comics and went on sale in 2005 for $2.25 USD. This issue contains ____ pages in ____, the current NM value is $2.25 USD. The Flash... Fastest Man Alive? 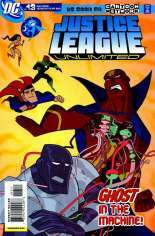 The Flash answers a JLA distress signal only to find that his fellow teammates have been trapped by the Mirror Master! Now a prisoner himself, the only person that can save The Flash is... The Flash?! 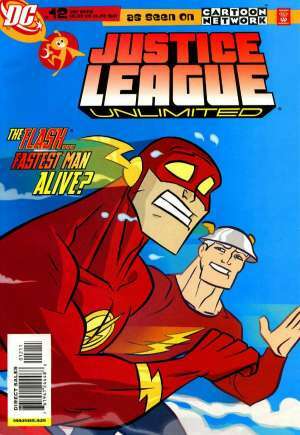 It's Jay Garrick to the rescue as the JSA-er makes a special appearance in this issue of Justice League Unlimited. I loved the issue. A good story starring the Speedsters. Knowing that The Flash in the JLA is Wally West, I understand that they couldn't have a Kid Flash in this story. But that's all that's really missing from this adventure was a Kid Flash. No, you couldn't have Impulse, he would have been too all over the place. His presence would have ruined the pace of the story.